Since we started sharing the new and improved algorithmic trading systems (S10 and D30) a few weeks ago we have received a lot of great feedback and demand. The good news is that the system kick started the week once again with positive trading results within the first hour of the week. The index opened lower and it caused the market the flip and flop a little between and up and down trend. But once the intraday trend took hold the systems both reached their T1 (first target) less than an hour after the opening bell to lock in $400 profit. The systems are still long 1 contract and deep in the money as you can see below. Also, one of our improvements to the systems was our improved Risk Containment and Equity Protection features. This improvement will be explain in more detail in another email/video but in short this reduces the amount of potential gain we give back when the market rolls over and starts moving against our second contract. For example in the past we would see our positions up $800 – $1500 but when the trade was closed we only realized $150 – $400. 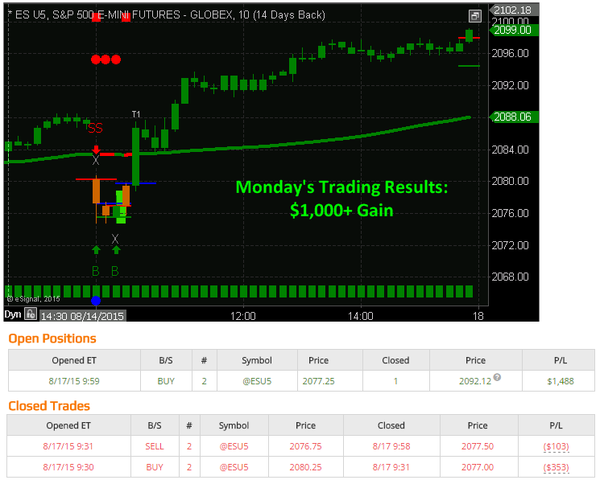 The improved systems now lock in more profits $450 – $950 in these similar trade situations. Now for the Not So Good News. To be honest this news isn’t all that bad but we want to be sure you know what is going on. In the past week the emails and phone calls have been rolling in faster than we can take them. The list of phone messages we need to listen to and call traders back is crazy long. Emails are the best and quickest way for us to respond, but if you would like to speak with someone PLEASE leave a phone message and we will return your call within a day or two.